10" x 15" x 6"
This is the same wood as the Beeswing Eucalyptus we use which comes from Australia. What we are using here has been "fumed" or smoked to a dark brown color. Fuming/Smoking is a new process that is being used to enhance the coloring and to highlight the figure in a variety of different woods. When we obtained this fumed Eucalyptus from our supplier, we thought it could be made even more beautiful by using a unique, penetrating, yellow stain. We experimented with several types and colors of stain to arrive at the bronze color featured here. It pleases us to be able to offer this new version of Beeswing Eucalyptus. Part of the joy of woodworking is experimenting with woods like these in order to enhance their natural beauty. Please call us at (301) 432-6131 to purchase this item. 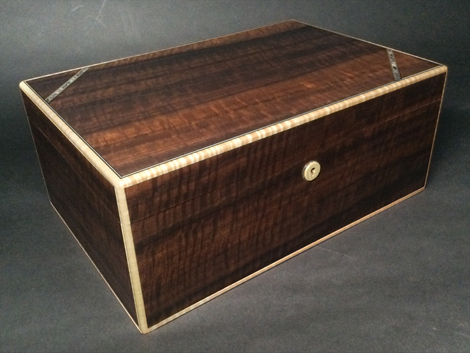 Copyright © 2019 Michael Dixon Humidors. All Rights Reserved. Site by Web Weaving.